SLED Primarily has 2 classes that you can take to become a SLED Certified Security Officer. 4 hour class to be Certified as an Un Armed Officer. Upgrade with another 4 hour class to become a Certified Armed Officer. Yes, you can schedule to take both classes in the same day. Individuals who want to start a new career. Companies who are getting behind on training to certify their officers. Re-certifying to keep your annual SLED card active. If you cannot come to Greenville and the Class size is large enough, we will come to your area with our “Mobile Setup” and conduct the training. To price this, we will have to know the location and class size. 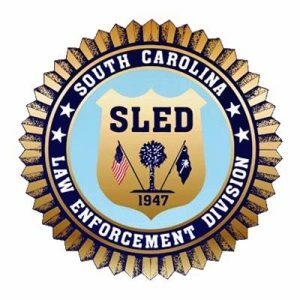 Individuals from other states who want to work in SC as a SLED Security Officer. Yes, some individuals work for companies that do business in SC or they live close enough to the SC border and would like to work for a SC Security company. Either way, you must get a SLED Card. CWP for SC residents. Here. Free weapons Training for women. Here. Primary Basic: (Mandatory) A basic knowledge of what you can do as a legal SLED Certified Security Officer on the property you protect. To become an ” Unarmed Officer”. This class is all you will need to be a basic SLED Certified Officer. Taking this class does NOT include weapons, Handcuffs, Use of Force and Authority to Arrest. You will be able to work as a SLED Security Officer and wear a uniform, observe and report with no arrest authority if you choose this class alone. 4 hour class. To break it down: In other words, To become a “mall security guard” all you need is Primary Basic because usually they don’t let you have too much authority. 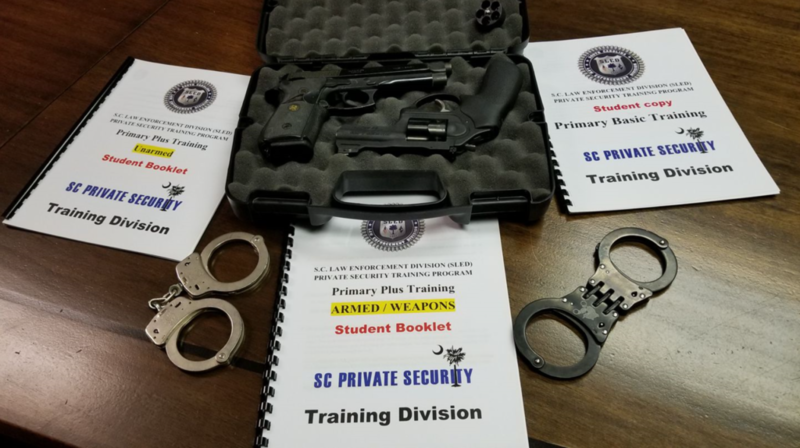 However, everything an officer needs to carry on his duty belt for example handguns, Taser, OC Pepper Spray, Batons and Handcuffs will have to be trained by a person that is Certified to train you with these weapons. This training falls under the Primary Plus Training. WE OFFER THIS TRAINING. For Taser classes, click here. For OC Pepper Spray classes, click here. You can hold more than 1 SLED Card. This is a great thing because some companies need part time Officers. So, you can be an Unarmed Officer at 1 company and become an Armed Officer at another. This also allows Officers to get more hours by being flexible working for more than 1 company. YOU WILL GET A SLED CARD FOR EACH COMPANY YOU WORK FOR. All SLED Certified Officers are required to have “Primary Basic” at a minimum. .NOTE: When you get done with any of the SLED training regarding “Primary Basic” or “Primary Plus” you will not be certified at that instant moment. YOU WILL have to send in your application to SLED with the training records from our company, with the SLED fees, finger prints, photo, etc. We walk you through this whole process. Once approved by SLED, then you will be an “official SLED certified officer”. Taser and OC Pepper Spray? We cannot fit Taser and OC Pepper Spray in the above classes because of the amount of time required. To do all of our training will take 2 full days to be a SLED Certified Armed officer with Handcuffing, Weapons, Taser and OC Pepper Spray. We can price a full package for this option per student or a group price. Can you meet SLED’s Requirements? click the photo below and review their policies and regulations for becoming a SLED Certified Armed or Unarmed officer. Here is what will DISQUALIFY you!